Are you hungry for telling data stories with beautiful visualizations? If so, we have a sumptuous treat for you. Engaging readers with interesting visuals without misleading them is not easy. Pie charts are often criticized because while at the outset they do seem to convey the information, people still have a hard time comparing the angles and sizes of each element. And yet many people ignore the critics and use a pie chart because they tend to err on the side of conveying an emotional comparison to their reader as opposed to an accurate comparison. Making pie healthier resulted in the Waffle chart! A Waffle chart is essentially a squarified pie. Since it does not involve angles, it’s easier for the reader to compare accurately as well as evoke emotional comparisons. 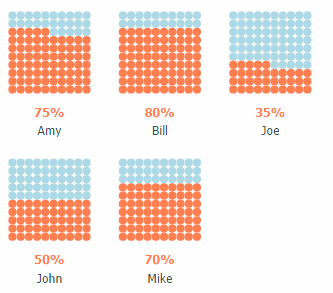 A big thanks to Gilberto Stankiewicz Chavez for building the Waffle chart as a custom visual for Power BI. A Waffle chart is a square divided by 10×10 cells. The value is displayed as percentage, so you can clearly see the difference down to 1%. To use, simply download Waffle chart from the visuals gallery and import it to your Power BI report.